537 points will be rewarded to you when you buy this item. 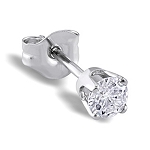 These cute diamond stud earrings a perfect gift for that special someone! 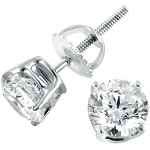 Crafted of White Gold , this studs for men is finished with a high polish. These solitaire stud earrings are handcrafted in lustrous gold & diamond.